Last major update issued on March 7, 2011 at 05:05 UTC. Minor update posted at 20:10 UTC. 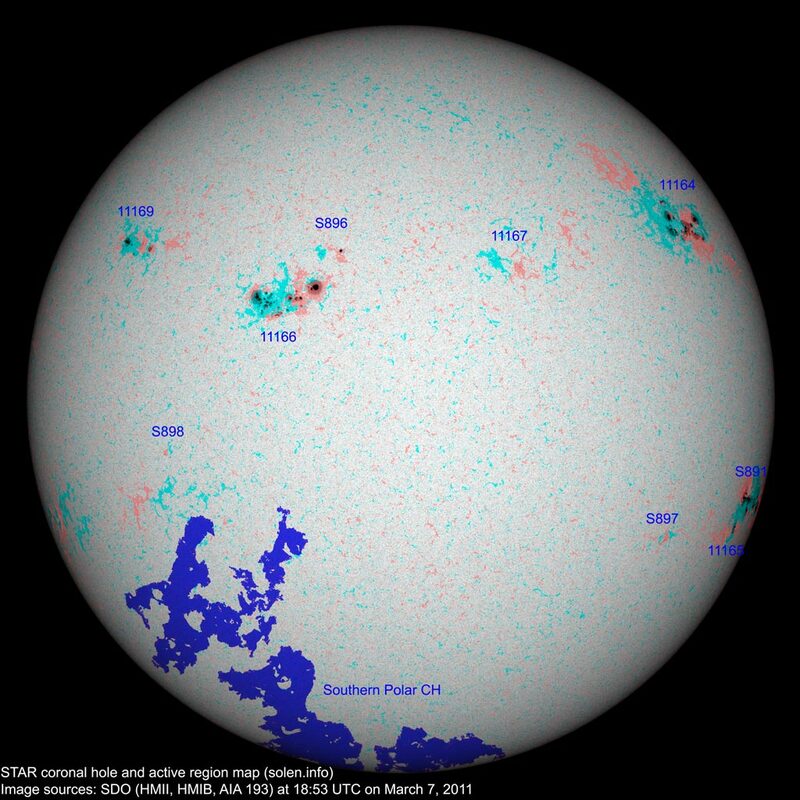 The geomagnetic field was quiet to unsettled on March 6. 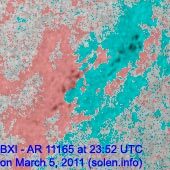 Solar flux measured at 20h UTC on 2.8 GHz was 142.5 (increasing 60.2 over the last solar rotation and a new high for cycle 24). The planetary A index was 5 (STAR Ap - based on the mean of three hour interval ap indices: 4.9). 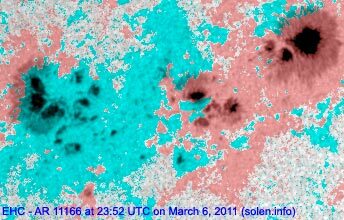 Three hour interval K indices: 11003122 (planetary), 01003222 (Boulder). Region 11164 developed further during the first half of the day with new flux emerging in the central parts of the region, then began to decay. What used to be the largest penumbra lost more than half of its area as several spots split off. The central penumbra is large, highly asymmetrical and has a magnetic delta structure. A major flare is still possible. Flares: C1.8 at 01:33, C1.8 at 04:15, C1.7 at 04:44, C4.6 at 05:32, C2.8 at 07:07, C2.4 at 07:33, C3.1 at 10:01, C4.7 at 16:19, C6.9 at 16:30, C2.3 at 19:37 UTC. Region 11165 did not change significantly and was quiet. 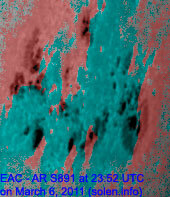 Observe that NOAA/SWPC has included S891 in this region. 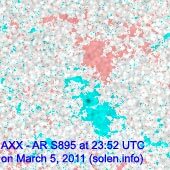 [S891] This region emerged in the southwest quadrant on March 3 and developed slowly the first days. 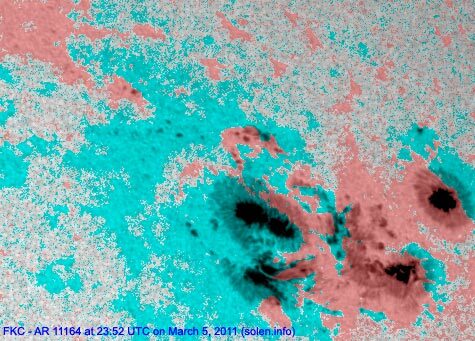 Rapid development was observed on March 6 with many new spots emerging and at least 2 magnetic delta structures forming. M class flares are possible in this compact region. Location at midnight: S17W69. Flares: C2.1 at 02:08, C3.7 at 03:45, C1.6 at 08:33, C2.6 at 09:04, C7.5 at 10:40, C1.4 at 21:57, C2.2 at 23:35 UTC. 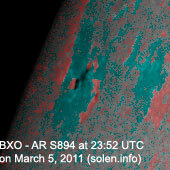 [S896] Spots emerged in the northeast quadrant, just north of region 11166, on March 6. Location at midnight: N16E22. 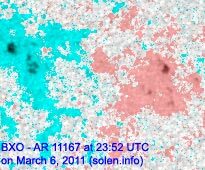 Minor update added at 20:10 UTC on March 7: A total of 5 minor M class flares had been observed until 19:30 UTC, 3 from region 11164, 1 from S891 and the only event of real interest, a long duration M1.9 event in region 11166 peaking at 14:30 UTC. 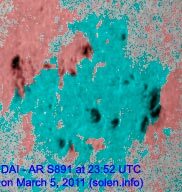 This event was associated with type II and IV radio sweeps and an Earth directed CME. 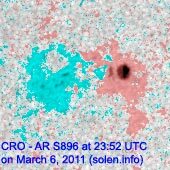 The CME could reach Earth late on March 9 or on March 10. 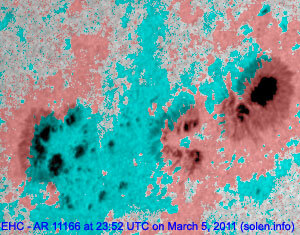 Otherwise region S891 has continued its amazing growth with most spots now inside a single very elongated penumbra. 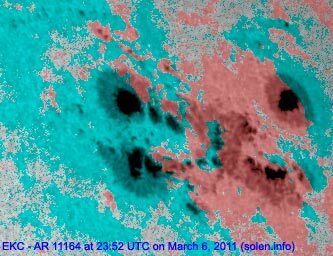 This region has the potential to produce a major proton event, possibly even an X class event. 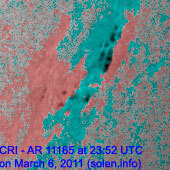 Two new spotted regions are visible. 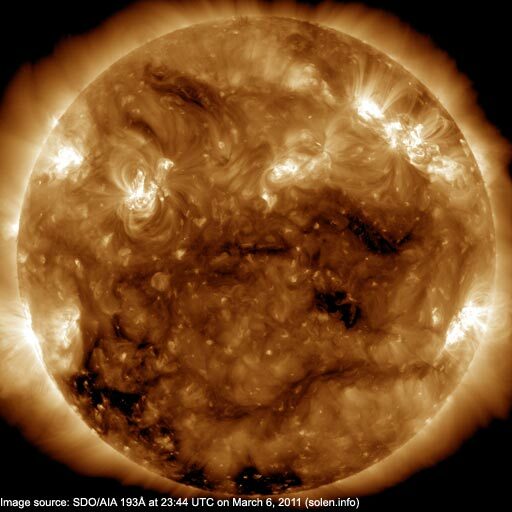 The latest coronal hole and active region map. 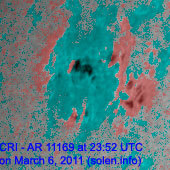 The largest flare of the day is in progress as this is written and seems to be peaking near the class M4 level. 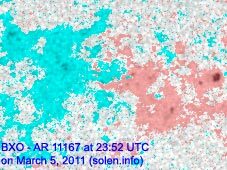 Solar flux at 17h UTC was 151.9. 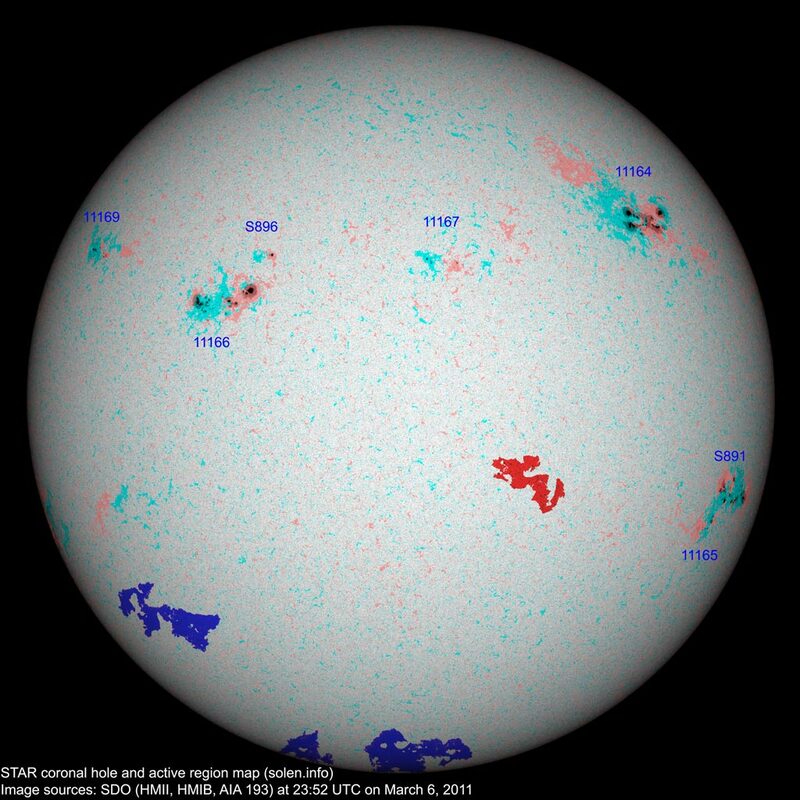 The geomagnetic field is expected to be quiet to unsettled on March 7 due to effects from the CME observed on March 3, with a chance of some active intervals. On March 8-9 quiet conditions are likely.